But thanks to the swift actions of his opponent, who used CPR and a defibrillator to save his life, Declan Harkin, 57, was able to serve his own special ace this weekend which could help save another life. On Saturday, Declan returned to Douglas Lawn Tennis Court, where his heart stopped just a week ago, to donate a defibrillator to Rob Jenkins, the opponent on the day who saved his life. 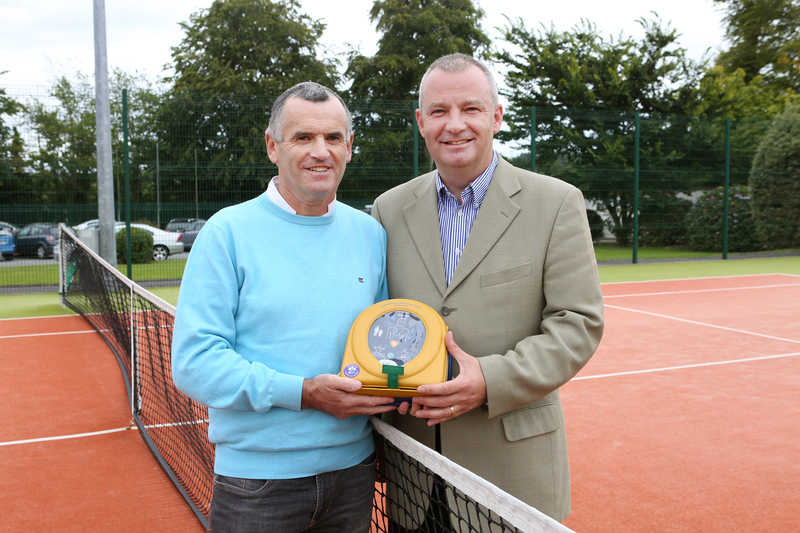 Rob, who works with the Cork Airport Police and Fire Service and volunteers for Crosshaven Coast Guard, plans to install the life-saving device in his own tennis club in Crosshaven. “There is just a 5% survival rate is you have a heart attack outdoors. If you don’t get the proper help within 10 minutes, you’re dead,” Declan said. Declan, whose brother died of a heart attack when he was just 43, was playing Rob in an Open Singles event at Douglas Lawn Tennis Court last Saturday week when he collapsed suddenly. “I remember it clearly. I was about to serve when I felt weak, and went down on my knees,” he said. Rob knew immediately that his opponent was having a heart attack and he sprang in to action. He began performing CPR while an ambulance was called and he used the club’s defibrillator — which had been installed last year — to shock Declan’s heart twice. Units of the Cork City Fire Brigade who were attending a fire nearby also assisted before HSE paramedics arrived. They rushed Declan to Cork University Hospital where he was treated by a medical team led by Eugene McFadden. Because Declan survived, Heartsine, the company which makes the defibrillator used to save him, agreed to give a device to him for him to donate. He said giving the new defibrillator to Rob was a “no brainer”. Both men hope the incident will highlight how important defibrillators and CPR training courses are. With CPR alone, chances of survival after sudden cardiac arrest are less than 10%. When a defibrillator is used in conjunction with CPR, it soars to more than 70%.